The start to a hurdles race is very much the same as the start in a normal sprints race. Athletes should adopt the same crouch start. In the sprint hurdle events, athletes will typically take 8 strides before reaching the first hurdle. This will mean that the athlete’s preferred lead leg for clearing the hurdles will be the back foot in the ‘set’ position at the start. 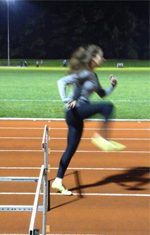 For 7 or 9 strides to the first hurdle, the preferred lead leg will be the front foot in the ‘set’ position. Athletes will need to accelerate to maximum speed very quickly before reaching the first hurdle. In the flat sprint races, athletes will typically stay in a low position for up to 30m to maximise their acceleration. Athletes in hurdle races are unable to do this as they will need to be in an ‘upright’ position to clear the first hurdle. Therefore it is advised that athletes stay in the low sprint position for the first 4 to 5 strides, after which they transition into the ‘upright’ position to optimally tackle the first hurdle. In the long hurdles events, the approach to the first hurdle is very much the same to the start in a long sprints events. Athletes should accelerate to race pace as quickly as possible whilst remaining relaxed. Rhythm between the hurdles is very important. For the sprint hurdle events, it is advised that athletes take 3 strides between hurdles. This will equate to 4 steps between hurdles as the first step will be the athlete’s lead leg coming over the previous hurdle. The first stride between hurdles will be counted when the athlete’s trail leg from the previous hurdle touches the ground. 3 strides in between hurdles will ensure that an athlete will clear each hurdle with the same leg lead. It is important to maintain speed in between hurdles, as the faster you go the easier it will be to increase stride distance. This will help for athletes who may be struggling to maintain the ideal 3 strides between hurdles. For the long hurdle events, strides between the hurdles is different. In order to clear each hurdle with the same leg, an athlete would need to run an odd number of strides in between hurdles which could range from 13 (professional standard) to 15 or 17. If an athlete wishes to alternate their lead leg then they must run an even number of strides in between each hurdles which could range from 14 to 16 or 18. It is advised that athletes learn to hurdle off both legs for long hurdle races as it is very hard and unlikely for an athlete to be able to maintain the same number of strides throughout the entire race due to fatigue and lactic acid build up. This means that at some point, usually the last 100m or so of the race, an athlete would have to change their number of strides as their stride length will be decreasing. To keep hurdling on the same leg an athlete would have to add 2 strides to their stride pattern, whereas to change lead leg they would only have to add 1 stride to their stride pattern. This would help keep speed loss at a minimum when compared to adding 2 strides. It is also advisable to practice on both legs as problems may occur during a race (e.g. strong wind, hitting a hurdle) which can put an athlete off their stride pattern meaning they may have to clear a hurdle with a different leg in order to maintain speed and rhythm.